Keep your eyes where your ears are. 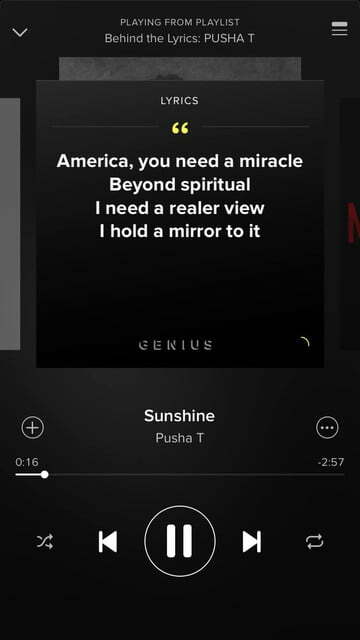 Spotify and lyric annotation site Genius have announced a partnership for a special playlist series entitled “Behind The Lyrics,” which shows you contextual information, artist quotes, and lyrics from about each song in the app as you listen. The first is “Behind the Lyrics (Hip Hop),” a curated playlist featuring songs from popular hip hop artists such as Rick Ross, Pusha T, and Future. Usually, you have to be a pretty big tech addict to look at your phone every five seconds, but now you can just say you’re learning about your favorite song. Genius playlists show lyrics and explanations, funny anecdotes, and stories from artists. Some of the information comes directly from the artist, and some from the Genius staff. The special info appears as soon as each song begins and refreshes at roughly five second intervals. Fans will get deeper into lyrics, artists will have more room to explain their artistry, and, Spotify’s ad value could improve, which means more revenue, and potentially more money for artists down the road. 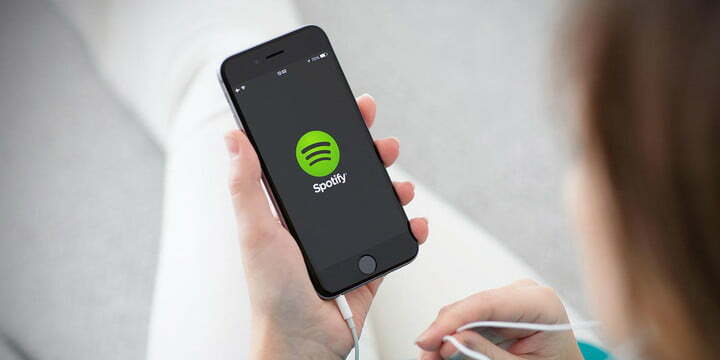 Spotify introduced video ads back in September 2014, where users of the free tier could watch a video ad in exchange for 30 minutes of ad-free music listening. Eight months later, the music streaming service announced plans for a video streaming component. With “Behind the Lyrics” there is no audible notification when the next piece of info is coming or what type of note it will be. So, in order to catch all of the info, you have to keep your eyes glued to your phone. 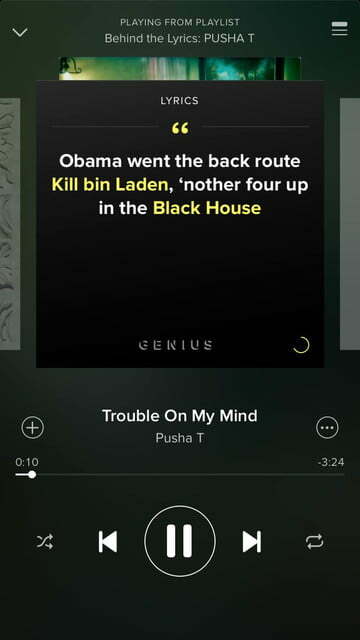 The “Behind The Lyrics” series will venture into the most popular songs next week with “Behind The Lyrics (Hits).” It’s currently only available to iPhone users and does not give app users full lyrics for songs, a feature that’s currently available on Spotify for desktop PCs since February 2015, thanks to a partnership with Musixmatch. The idea of reading the lyrics to music like the late, great David Bowie’s 9-minute Blackstar on iPhone sounds very appealing indeed.